Everyone wants to be a better person, and everybody has a story to share. More than ever, now that we are parents, we need to be broad-minded enough to let ourselves explore on how we can become a better person not only for ourselves but also for our kids. Being a parent for the first time is like trotting on unknown waters – it’s a first every time and what’s ahead is a surprise we should embrace ourselves from. Last week, Nestle Nankid invited parents and media partners for an afternoon of discussion with the experts. Hosted by the Philippines’ premier talk show host, Mr. Boy Abunda, the event aimed to help parents understand their roles better so they could in return reshape the future of their children even more. Failure is inevitable and it is life’s greatest teacher. I can’t remember everything from my perfect science exam but one periodical period, I got 99/100 and until today, I remembered my mistake – that the other term for a leaf’s blade is lamina and not petiole. See we learn from our mistakes and failure is the path to success. Grow means to develop and evolve. Mindset is the way of our thinking. Together, Growth Mindset is changed set of thinking. There are different aspects of how we can see and observes ourselves as parents as well as our children whether we are developing on our way of thinking by being broad and open-minded. Also we need to have adjustments so we could improve and passed the state of being fixed or stagnant. Certain aspects such as in Goals, example given, is our outlook to the grading system. In Effort, Growth mindset required to grow, move forward and mature. You can’t give what you don’t have so we need to be mindful first of our actions since we are our children’s model. In Failure, Growth mindset meant admitting of their failures and set back while seeing opportunity to progress and learn from failure. In Achievement, Growth mindset meant increase in development, and unlocking new milestones. 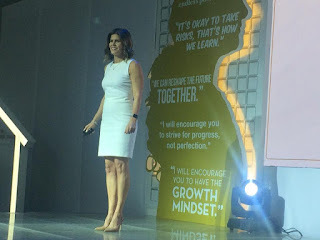 Ms. Melissa Benaroya, LICSW, a renowned parent, coach, and speaker from Costa Rica whose extensively studied the Growth Mindset movement, taught us that our actions are more important that words when we requested the audience to make an OK sign in our hands and put it on our chin. She said chin but she put it on her cheek. Most of the audience put their hand on their cheek instead on their chin – that is a self-explanatory example how action speaks louder than words. Parents are encouraged to check their selves by first managing our mistakes especially when done in front of our kids like yelling. Yelling is a negative action that most parents do when they are already frustrated, exhausted and mad. By admitting our mistakes, children will also realize that we are also humans – imperfect and err. Let’s accept that we have a fixed mindset, and then be conscious enough to alter our mind and make room for change and growth. Slowly but mindfully, our openness to want to learn more and the desire to be a better parent for our children will help us. I’m a believer that we should throw compliments like a confetti. But Parenting Expert Melissa said that effect of praise can back fire hence we should be careful in giving praises to our children as there are different ways that it could affect our children. For one, Praises like “hard-working’ is better that telling them they are smart as the character they are building will be focused on what and how we say it to them. We need to acknowledge our child’s success and encourage them after they fail. Make time for our kids by simply noticing them in the way they think, how they feel and the factors that led them to make a certain decision even in in the simplest things. How we give orders to them can actually effect on whether they will follow wholeheartedly, half-heartedly, or worst, resist the command and rebel. Ms. Melisa tried to dictate the audience by commanding them like brush your teeth, go to bed, get your books, then asked us how do we feel. The result is not surprising. The audience felt as if they were robots without a choice, unhappy, annoyed, helpless, bored, no fun and even pissed. Then, Ms. Melissa commanded the audience in a loving way, telling them to brush your teeth to preserve it, sleep early so you could get a good night sleep that your body needs, that we need to study so we could learn and enjoy class, she then asked us again how do we feel. Just the same, the result was no surprise. The audience felt valued, that they belong, they feel that they matter and that it’s an affirmation of love and care. Our intention as parents are always good, it’s all for the benefit of our family and children, hence, it won’t hurt to command them in a loving way. Giving and asking curiosity questions on what will happen if they won’t follow our loving requests and commands because again, the language that we use matters. Be mindful. In the parenting world there is a new superhero, it is the prospect of the future, the process of learning that will surely be attained after a period of time. It is the word “yet”. “You can’t tie your shoes properly“is demeaning, but when you say “You can’t tie your shoes properly YET”, you assure the child that it’s normal if he can’t do it right away, but with more practice and in no time, he’ll be able to pull his lace properly and tie his shoes. How we deliver even the simplest everyday conversations to our children do matters. Be mindful. We need to Nurture our kids by being mindful of our actions and behaviours. Monkey see, monkey do. We need to make room for Growth. Keep in mind that mistakes are inevitable and that it is the way to success and an opportunity to learn. Keep our Mindset open and broad. Words and how we deliver it matters. Use of the word “YET” makes them optimistic and open in the prospect of the future. Don’t delay, learn how to foster optimal development through optimal nutrition and optimal growth mindset. Help #ReshapetheFuture today! Check out Parentology+ at Trinoma Mall on Feb. 2 and 3. Visit www.facebook.com/nankidoptipro for more details.